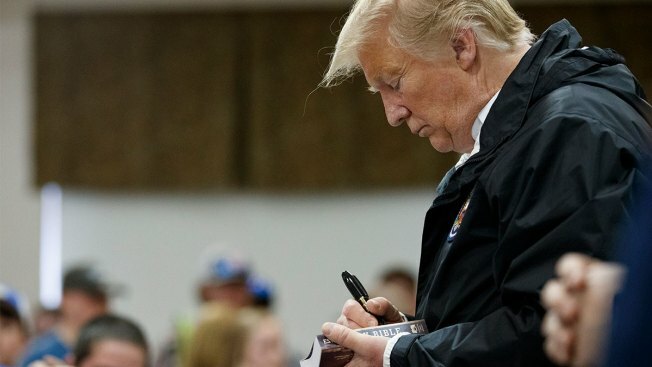 President Donald Trump signs a Bible as he greets people at Providence Baptist Church in Smiths Station, Ala., Friday, March 8, 2019, during a tour of areas where tornados killed 23 people in Lee County, Ala.
A Bible said to have been signed by Donald Trump sold on eBay for $325, according to the listing. The item was described as a 4.5-inch tall "mini bible" signed by Trump at a rally in 2016, which would have been before his inauguration. The listing indicated the Bible would be sold with a certificate of authenticity. The seller states it "obtains all our memorabilia and autographs in person directly from the celebrity signers themselves."